I’ve talked about how Delta has some great international configured Business Class options on domestic routes. As a result of a little planning, I’ve been upgraded to another internationally configured Business Class on a domestic route. The key to finding these planes is to look at the plane type and see what types of seats are available in Business Class. If you aren’t familiar with the domestic routes these internationally configured planes fly, you can check out the international departure airports of Delta’s dedicated lie-flat seat routes. These airports are a good starting point. I booked my flight just before the 5 day Platinum upgrade window and then navigated to the Delta site to assign my seats. 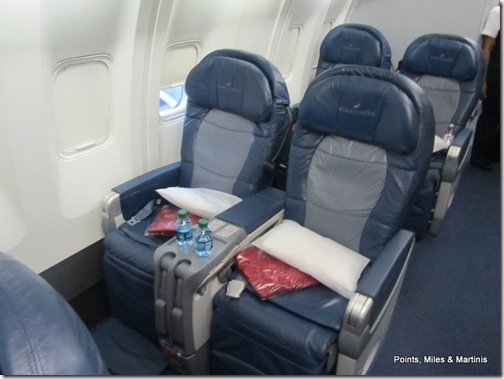 When I logged into Delta and the reservation, bam, I was already upgraded to internationally configured Business Class on a Delta Boeing 767 with cradle Business Class seats. This time I was able to select my seat in advance, unlike the last time I flew this internationally configured Business Class cabin. So I selected 1A. This seat is superior since it is a window seat and has no seat in front to recline into your lap. Which seat would you select given the open seats on this plane? I’m still chasing a domestic route with the new lie-flat seats on the Boeing 767 and Boeing 747. The new lie-flat seats are really comfortable and allow for full recline into the fully lie-flat position. On my upcoming domestic flight on an internationally configured plane in Business Class, I”ll have the recline Business Class seats. These are otherwise referred to the cradle seats. Even though they don’t recline all the way into the lie-flat position, they offer extra room, great recline for a domestic route and hopefully a nice meal. If you are interested in getting a little more space on a domestic flight, check out the internationally configured planes that Delta operates domestically. It will greatly increase your chances for an upgrade and allow you to fly in style.